(Photo by Peter Hvizdak – New Haven Register) During a photography portrait session with a New Haven Register photographer on Jan. 30, 2014, in New Haven, an African-American male of New Haven, a convicted felon in his late 20s, shows off a 9mm Smith & Wesson model 659 semi-automatic firearm that he says is stolen and which he says he uses for his personal protection. A striking and sure-to-be-controversial photo leads the New Haven Register’s website and print edition front page this morning. 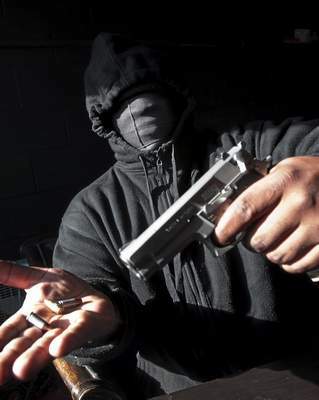 “Joe,” an anonymous New Haven man, poses in a menacing, face-covering disguise with a handgun that he says is both stolen and against the law for him to possess since he is a convicted felon. There were two major points of discussion among New Haven Register editors prior to publishing Shahid Abdul-Karim‘s story, which features an interview in which “Joe” (not his real name) talks about why illegal guns proliferate on the streets of New Haven from the perspective of someone who feels he needs to have one to defend himself. 1. We are generally uncomfortable with using anonymous sources, for a lot of reasons. What ulterior motives might be at play that anonymity would cover up? How do we confirm what they are saying is true? 2. Is the photo constructive in telling the story and conveying information and meaning to readers, or is it gratuitous “click bait” at best, and glorifying of some kind of tough guy violence mentality at worst? We were comfortable with the first point because Shahid did the work to be confident that “Joe” is who he says he was. There was little to nothing to be gained by talking to us. Point by point, we checked out what he said to us (for example, that guns are sometimes stolen from National Guard armories) and ran counter-point from law enforcement and others. Most of all, we felt that anonymity was justified in this case because of how important, and rare, it is to hear from the kind of person no one ever hears from when urban violence and illegal guns are written about. Most of all, we hope the story will spark a dialogue about the issue. For context, see Rich Scinto‘s story on the toll that gun violence took in New Haven last year, and Brian Charles‘ story on the growing rate of income disparity and poverty in New Haven. If you have questions or insight into the story or how we handled it, New Haven Register editors will be discussing it today at AskTheRegister.com. Please come join in the conversation. 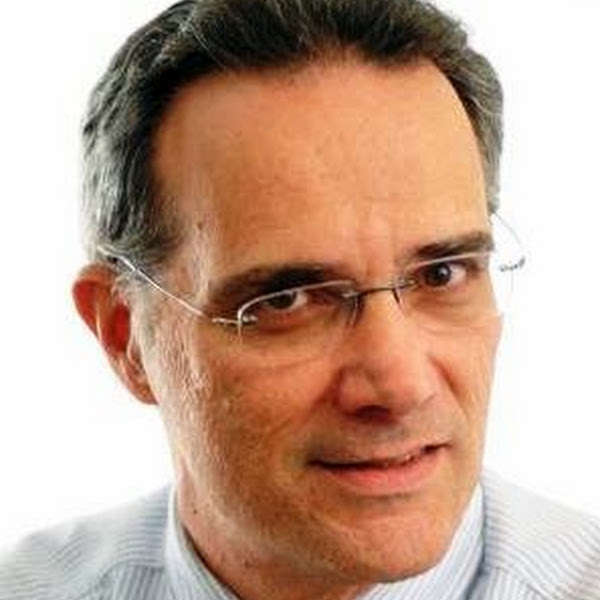 Joe Amarante, a 30-year veteran editor, reporter and columnist, has been named Arts and Entertainment Editor at the New Haven Register. He succeeds Donna Doherty, who retired late last year after eight years in the position. After graduating from the University of New Haven, Amarante started his career at the New Haven Journal-Courier in the 1970s. He has more than 28 years experience covering television, radio and other media, and is a former member of the Television Critics Association. He was TV Editor at the New Haven Register for years, and most recently has served the paper as a general assignment reporter, columnist and editor. His column writing has been recognized with awards by SPJ, the New Haven Committee on Italian Migration and the Hamden Unitas Club. He is married to Sue and has four children. Amarante can be reached at jamarante@21st-centurymedia.com. Follow him on Twitter at @joeammo. Adam Stuhlman has been named as the first participant in an annual paid internship program at the New Haven Register established in the memory of longtime editor and reporter Ann DeMatteo. The program was announced earlier this year, after DeMatteo passed away at the age of 56 after a battle with cancer. DeMatteo worked for 34 years as a reporter, bureau chief and editor at the New Haven Register. 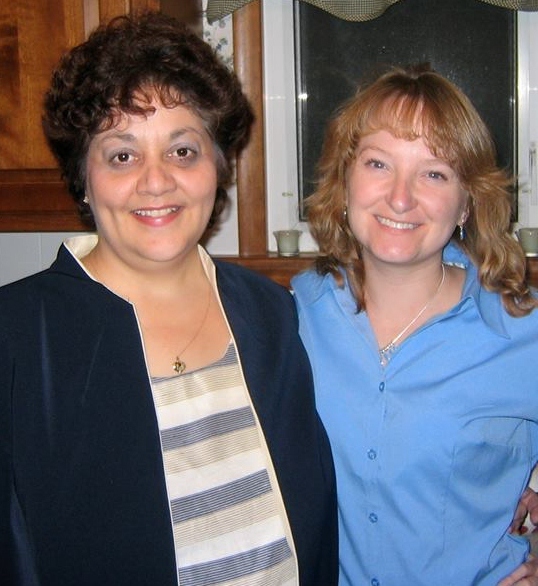 She was named managing editor of its sister daily, The Middletown Press, in the fall of 2012. For many years, DeMatteo ran the internship program at the New Haven Register, training dozens of future journalists. Stuhlman is a graduate of Southern Connecticut State University with a bachelor’s degree in journalism. He has worked as a freelance reporter for the New Haven Register, CTNewsJunkie.com, the Middletown Press, the New Britain Herald and the Hartford Guardian. He is also active with the Veterans Art Foundation, which uses art therapy to help veterans suffering from post-traumatic stress disorder. Donna Doherty is retiring from the New Haven Register this week, on the day before Thanksgiving. We’re not sure what to do about it. As arts editor since 2005, Donna has become an authority on a segment of life and culture that is hugely important to our community. We’re not sure how to replace her, because we know we won’t be able to match what she contributes to our newsroom. And if we’d been smarter about realizing what we had in Donna, we would have given her a team of minions to smartly explore the richness of the arts scene around Yale University, New Haven, the Shoreline and beyond. The remarkable thing about Donna is that this role was just the latest diverse gig in the career of a Renaissance woman. 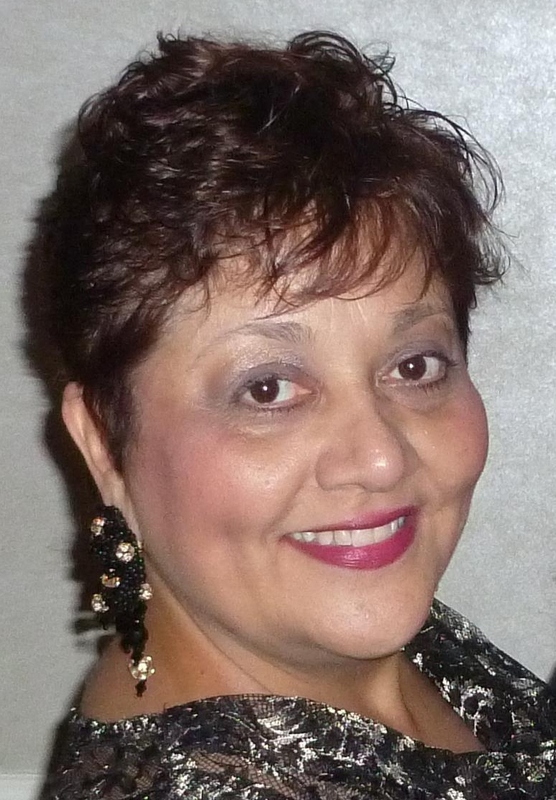 Decades ago, she was a sports reporter for the New Haven Register. She went on to serve as editor of Tennis magazine. She covered courts at one point. Here’s her account of covering the Black Panthers trial for the New Haven Register as a 20-year-old student at Northeastern University, and how the intensity of that assignment prompted her to go for a “change of pace” and try sports. 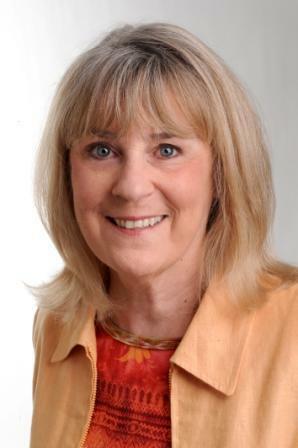 Our newspaper has been enriched greatly by Donna’s work, off and on, from the time she wrote as a student more than 40 years ago to her role covering the richness of the New Haven area arts scene. And we’ve been enriched to work beside her. The gap between the country’s wealthiest and poorest is at its highest point in the past 100 years. The gap between white and minority Americans is far greater. For every $1 in assets held by the average white family, the average black family has 15 cents, and the average Hispanic family has 17 cents. Poverty in Connecticut has a profound impact on education, health care, crime, housing and economic development. It looms over those issues. It’s why some aspects of them seem unsolvable. We’re making poverty a full-time reporting beat, and we’re excited to announce that Brian Charles will be joining our staff in that role on Monday. Brian was recently named Journalist of the Year for Digital First Media‘s mid-sized daily newspapers, partly in recognition of his work investigating a police shooting of an unarmed black teenager for one of our sister newspapers, the Pasadena Star-News, in California. He is a New York native who graduated from Purchase College with a bachelor’s degree in 2005 and Antioch University-Los Angeles in 2010 with a master’s degree in creative writing. During his time as a reporter in California, he was active as a member of the Los Angeles Chapter of the National Association of Black Journalists and as an executive committee member of the Black Journalists Association of Southern California. 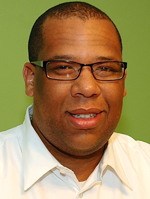 Brian will be based at the New Haven Register, but we expect his work to have a statewide impact and also appear in The Middletown Press, The Register Citizen, Connecticut Magazine and other publications. He can be reached at bcharles@nhregister.com. Follow him on Twitter at @jbriancharles. The New Haven Register will unveil a new design for its print edition on Tuesday, June 11. It will include a new front page “flag,” a more modern typeface throughout, and easier and more consistent navigation through the different sections of the newspaper. The new design will also include an at-a-glance digest on page A2 each day of some of the most interesting news from around the world. It follows and matches redesigns launched last fall for two sister daily newspapers in Connecticut, The Middletown Press and The Register Citizen of Torrington. 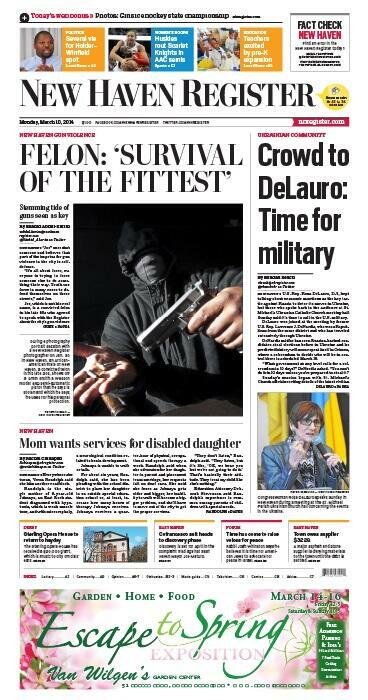 The look was crafted by designers at the San Jose Mercury News. The last major print redesign of the New Haven Register was 10 years ago, in April 2003. A redesign of the New Haven Register’s website will come soon after the print redesign. It is tentatively scheduled for late July. The New Haven Register was recognized with the Connecticut Society of Professional Journalists’ annual Stephen A. Collins Public Service Award Thursday night. It honors work by Michelle Tuccitto Sullo in exposing inadequate police response to reports of missing adults and profiles of missing adult cases by Brian McCready and Ann DeMatteo. The effort also included creation of a blog and “Missing in Connecticut” Facebook page that continues to spread alerts and information about the missing and connect their families with resources. It helped lead to the creation of a special unit of the Connecticut State Police dedicated to missing persons cases. The public service award was especially meaningful to Register staff as a tribute to DeMatteo, who died Sunday after a battle with cancer. It was one of 87 awards won by Digital First Media staff, including 37 first place honors, in the Connecticut SPJ’s 2012 Excellence in Journalism Awards. That’s up from 65 awards and 27 first place honors last year, and 56 awards, with 20 in first place, the previous year. The New Haven Register won 32 awards, followed by Connecticut Magazine with 18, The Middletown Press, 12, the Litchfield County Times, 10, and The Register Citizen, 5. Passport Magazine and Digital First Media weeklies the West Hartford News, Shoreline Times, Simsbury News and Westport Minuteman were also honored. This year’s contest included special categories for coverage of Hurricane Sandy’s impact on Connecticut and the mass shooting at Sandy Hook Elementary School in December. Digital First Media, which put more than 100 journalists from Connecticut and its sister papers in other states on the Sandy Hook story, was recognized for spot news reporting, general news reporting, page layout and photography in the Sandy Hook category. The New Haven Register also won first place for Best Interactive Graphic for a directory its data team put together highlighting the stories of the 26 Sandy Hook victims. An interactive graphic the data team helped The Middletown Press’s Viktoria Sundqvist put together on statewide school superintendent salaries also won a first place award.